listen)), is unclear. Bang is a Thai word meaning 'a village on a stream', and the name might have been derived from Bang Ko (บางเกาะ), ko meaning 'island', stemming from the city's watery landscape. Another theory suggests that it is shortened from Bang Makok (บางมะกอก), makok being the name of Elaeocarpus hygrophilus, a plant bearing olive-like fruit. 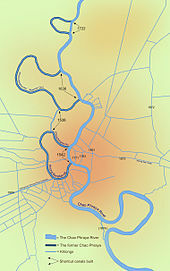 [d] This is supported by the former name of Wat Arun, a historic temple in the area, that used to be called Wat Makok. ^ a b Tangchonlatip, Kanchana (2007). "กรุงเทพมหานคร: เมืองโตเดี่ยวตลอดกาลของประเทศไทย" [Bangkok: Thailand's forever primate city]. In Thongthai, Varachai; Punpuing, Sureeporn. 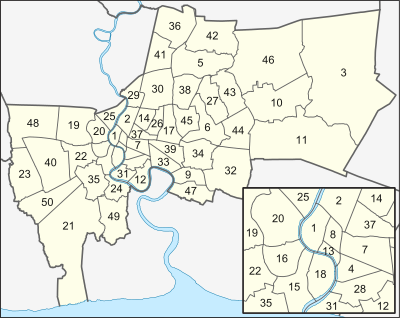 ประชากรและสังคม 2550 [Population and society 2007]. Nakhon Pathom, Thailand: Institute for Population and Social Research. Retrieved 26 September 2012. ^ "กรุงเทพมหานคร". Royal Institute Newsletter. 3 (31). December 1993. Reproduced in กรุงเทพมหานคร [Krung Thep Mahanakhon] (in Thai). Archived from the original on 2016-12-10. Retrieved 12 September 2012. ^ "Record Application Search". Guinness World Records. Retrieved 2016-12-02. (Registration required (help)). ^ "คำสั่งหัวหน้าคณะรักษาความสงบแห่งชาติ ที่ ๖๔/๒๕๕๙ เรื่อง การให้ผู้ว่าราชการกรุงเทพมหานครพ้นจากตำแหน่ง และการแต่งตั้งผู้ว่าราชการกรุงเทพมหานคร" (PDF). Royal Gazette (in Thai). 133 (พิเศษ 238 ง): 9–10. 2016-10-18. ^ "Bangkok Finally Gets Its Own Provincial Slogan" (PDF). Bangkok Inter News. 5 (2): 10. April–June 2012. Archived from the original (PDF) on 16 October 2015. ^ Philip, Bruno (21 Jul 2011). "Thailand, Sinking: Parts of Bangkok Could Be Underwater in 2030". Time. ^ Sattaburuth, Aekarach (2015-07-23). "Bangkok 'could be submerged in 15 years'". Bangkok Post. Retrieved 23 January 2017. ^ Engkagul, Surapee (1993). "Flooding features in Bangkok and vicinity: Geographical approach". GeoJournal. 31 (4): 335–338. doi:10.1007/BF00812783 (inactive 2018-09-19). ^ Krongkaew, Medhi (1996). 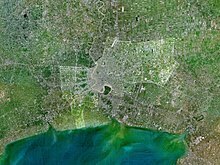 "The changing urban system in a fast-growing city and economy: The case of Bangkok and Thailand". In Lo, Fu-chen; Yeung, Yue-man. Emerging World Cities in Pacific Asia. United Nations University Press. p. 322. ISBN 978-92-808-0907-7. ^ McGrath, Brian (2005). 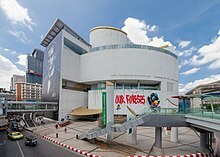 "Bangkok's CSD". In Benites, Cecilia; Lyster, Clare. Regarding Public Space. New York: Princeton Architectural Press. pp. 46–53. ISBN 9781568985442. ^ Ocharoenchai, Nanticha (2018-11-19). "Seeing green is believing". Bangkok Post. Retrieved 2018-12-14. ^ "Tower project 'suspicious'" (Editorial). Bangkok Post. 2017-07-01. Retrieved 1 July 2017. ^ "A shopping complex, or a 'green lung'". The Nation. 2015-05-13. Retrieved 13 May 2015. ^ Fong, Jack (May 2012). 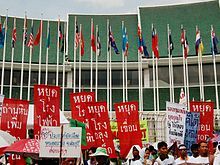 "Political Vulnerabilities of a Primate City: The May 2010 Red Shirts Uprising in Bangkok, Thailand". Journal of Asian and African Studies. 48 (3): 332–347. (Subscription required (help)). ^ Caldwell, John C. (1967). "The Demographic Structure". In Silcock, T.H. Thailand, Social and Economic Studies in Development. Canberra: Australian National University Press. pp. 29–33. and Skinner, G. William (1957). Chinese Society in Thailand: An Analytical History. Ithaca, NY: Cornell University Press. pp. 17–18. cited in Goldstein, Sidney (August 1972). The Demography of Bangkok: A case study of differentials between big city and rural populations (PDF). Research reports. Bangkok: Institute of Population Studies, Chulalongkorn University. p. 32. Archived from the original (PDF) on 31 July 2013. ^ "Big Cities, Big Business: Bangkok, London and Paris Lead the Way in Mastercard's 2018 Global Destination Cities Index" (Press release). 25 September 2018. Retrieved 2018-10-06. ^ "Bangkok Claims Title as World's Most Visited City: 2016 Mastercard Global Destination Cities Index" (Press release). Mastercard. 2016-09-22. ^ "Defining What Makes a City a Destination (2017 Destination Index)" (Press release). MasterCard. 2017-09-26. Retrieved 6 October 2018. ^ a b Chongkittavorn, Kavi (2002). "The Media and Access to Information in Thailand". In Islam, Roumeen. The Right to Tell: The Role of Mass Media in Economic Development. WBI Development Studies. Washington, D.C.: The World Bank. pp. 255–266. ISBN 978-0-8213-5203-8. ^ "2015 Year to date Passenger Traffic". www.aci.aero. Retrieved 2016-12-10. 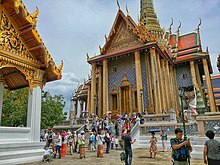 This article incorporates public domain material from the Overseas Security Advisory Council document: "Thailand 2012 Crime and Safety Report: Bangkok". Overseas Security Advisory Council website. Bureau of Diplomatic Security, U.S. Department of State. 14 March 2012. Retrieved 24 September 2012. ^ a b c "Thailand profile". BBC News. 2018-01-09. Retrieved 2018-12-25. ^ Watanavanich, Prathan (1995). "Urban Crime in the Changing Thai Society: The Case of Bangkok Metropolis". In Miyazawa, Koichi; Miyazawa, Setsuo. Crime Prevention in the Urban Community. Deventer, The Netherlands: Kluwer Law and Taxation Publishers. pp. 193–210. ^ AFP. "Thai police seize $45 million worth of meth from convoy in Bangkok". Frontier Myanmar. Retrieved 2018-12-25. ^ "Thai Police Seize $20 Million Worth of 'Yaba' Meth Pills". BenarNews. Retrieved 2018-12-25. Hamilton, Annette (2000). "Wonderful, Terrible: Everyday Life in Bangkok". In Bridge, Gary; Vatson, Sophie. A Companion to the City. Blackwell Publishing. pp. 460–471. ISBN 978-0-631-23578-1. Van Beek, Steve (2018). News from the 90s; Bangkok 1890–1899. Bangkok: ปิยวีร์ รื่นจินดา. ISBN 9786169317104. Retrieved 2018-11-24.